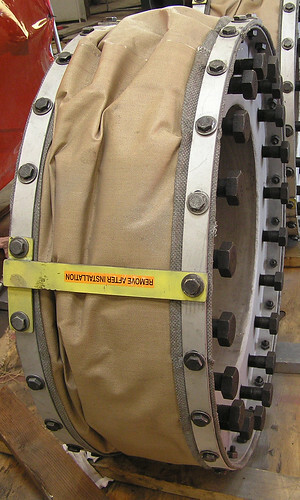 These are 24″ diameter fabric expansion joints with an overall face to face dimension of 12″. Each expansion joint weighs 300 lb. Installed in the inlet and exhaust piping of a hot air blower, they can withstand temperatures of up to 850F. These expansion joints were fabricated in three layers that consisted of aluminized fiberglass, ceramic fiber, and silica treated fabrics. 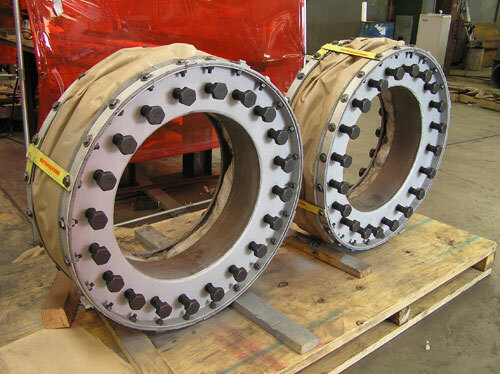 The flanges were fabricated from carbon steel with special hex nuts welded to the inside of the bolt holes. The stud bolts are in place to assure correct alignment of the bolts to the flange bolt holes. Visual inspection and trial fitting of the stud bolts were performed to assure quality and performance.